For a very long time in Iceland there was little art. It wasn’t because Icelanders were not creative or artistic but grinding poverty where people lay in bed because there was nothing to eat, did not allow for money to be spent on art supplies. There was very little silver coin. Financial transactions were mostly done in trade. 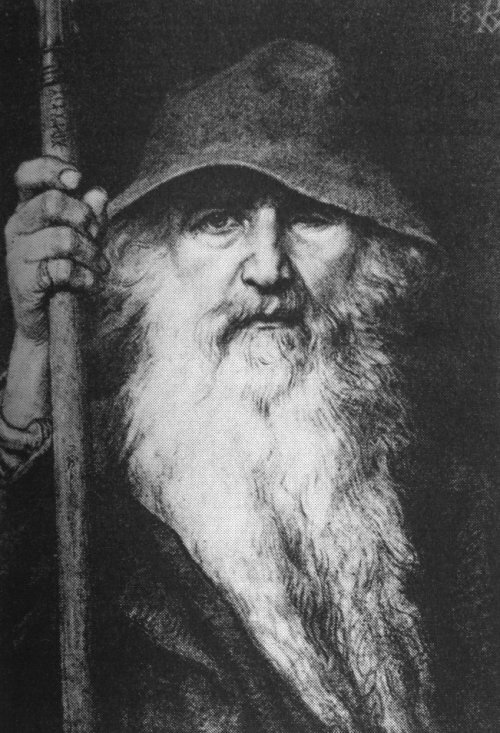 The Icelandic land owners would trade their wool, meat, fish, feathers, skins, knitting, sheep, horses, with Danish traders and the Danish traders would, in return, provide all those necessities Iceland could not provide such as nails, horseshoes, European cloth rather than wadmal, needles, brandy, tobacco, sugar, rice, rye flour. The list of items needed from Europe was large, seemingly endless. The traders set the prices for both buying and selling. There was woodcarving because there was driftwood available. It can be seen in askar, bed headboards, trunks. 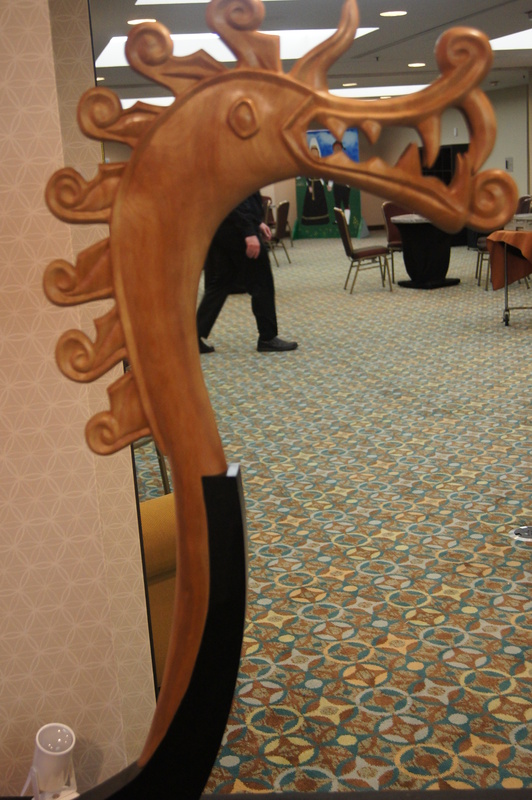 Therefore, it seems particularly appropriate at this INL convention that the two artists who have their work on display are both sculptors working in wood. One is Tryggvi Thorlief Laram. His sculpture, one cannot really call it carving, is based around Germanic and Icelandic history and myths. 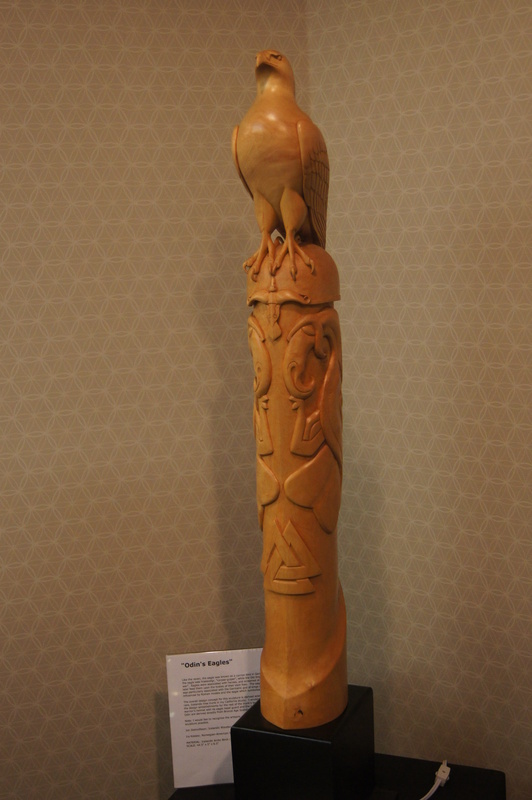 A three dimensional piece from Icelandic arctic birch with a base made from American black granite is called Odin’s Eagle. 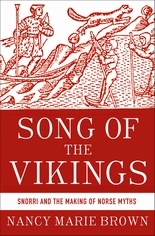 Tryggvi informs the viewer that a Scandinavian name for an eagle was corpse-gulper and, it was believed, that at the birth of a prominent hero, an eagle would scream. That same eagle would later feast on the bodies of the enemies of the hero. Tryggvi’s biography says that he was born in 1956 in Hafnarfjordur, Iceland to a Norwegian-American father and Icelandic mother and at three years of age he immigrated to California. . In 1975, following in his father’s footsteps, he served as an American soldier in Northern Italy. Then, in the 1980’s, he returned to Iceland to retrace his ancestry while serving aboard Icelandic fishing trawlers. Currently, he lives in California. His work is impressive because there is a solidity about it that evokes the ages. It is not just that his subject matter is taken from ancient times but also the way he treats the medium. The solidity of the wood gives a sense of age and permanence and quickly draws a viewer’s attention.